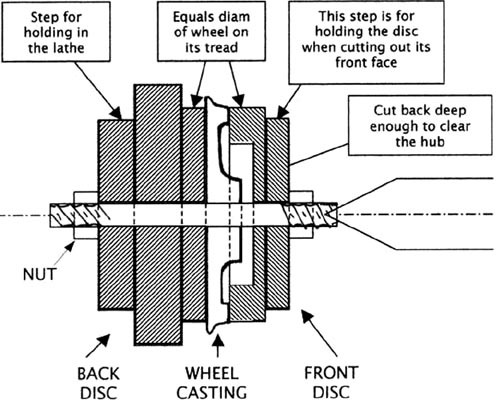 Castings have spokes of approximately scale thickness. They are not expected to be strong enough to resist turning forces without sufficient support especially if a form tool is used to shape the tread. To avoid any twisting from the hub make sure that the front disc is recessed to provide a gap so that all the torque is exerted at the rim. Make the mandrel a slightly loose fit. Then if the nuts are done up finger tight you can rest a dial indicator on the casting rim and tap it central before final tightening up. If you have a large enough chuck, it is handy to make the holding rim big enough to let you reach in with a spanner between the jaws to hold the nut. You will need a fresh pair of discs for each size of wheel. I use pieces cut from free-cutting Aluminium round bar. 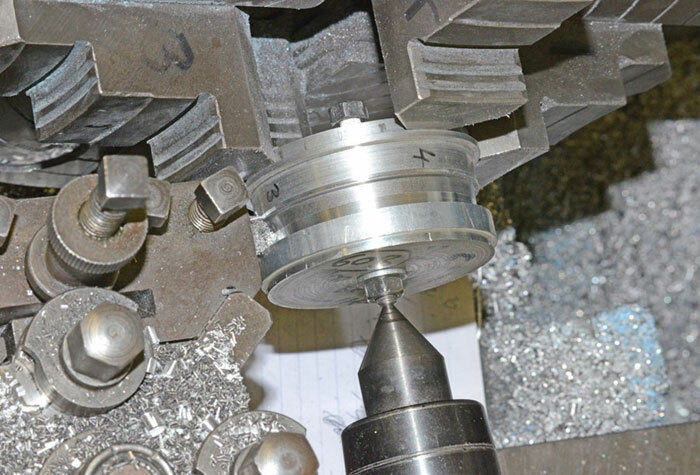 A driving wheel casting being machined between a pair of aluminium supporting discs.